Ultimate USA Weddings and Bridal Dove demonstrate their skills on the world’s largest party, wedding and event planning online network, PartyPOP.com. PartyPOP.com recently made headlines by offering truly free wedding invitations to every bride and groom in the USA, Canada and U.K. The company's website features more than 2 million party, wedding and event planning professionals and is expanding daily as vendors list their businesses on the network. They include a diverse selection of experts and many of them are giving out certificates for free printed wedding invitations in collaboration with PartyPOP.com. Ultimate USA Weddings is a New York wedding destination company that helps brides and grooms with marriage licenses, cakes, photographers, videographers, flowers and much more. Ultimate USA Weddings, assists brides and grooms in planning a budget friendly wedding in New York City. The company’s team of professionals has been offering wedding related services for over 5 year’s. It's located 55 floors above the streets of Manhattan, at the Empire State Building. Customers can choose from several wedding ceremony locations in New York City and can select one of the experienced New York City Reverends, that will assist in creating a personal and intimate wedding ceremony. The bride and groom can also choose a customized New York City Wedding Package for a budget destination wedding. Ultimate USA Weddings can be found online at http://www.partypop.com/v/4278031. Bridal Dove, guides brides and grooms during the entire wedding planning process. As wedding coordinators, the company engages in in-depth consultation with the bride and groom based on experiences, insights, and coordination of the entire team. Throughout the wedding planning process, the team provides the bride and groom with expert advice to ensure that the wedding meets the clients expectations. Bridal Dove can be contacted online at http://www.partypop.com/v/4380526. Before the Internet era, the professionals at PartyPOP.com were successful hands-on party planners and special event producers. For more than a decade PartyPOP has translated 30 years of party planning experience onto the Internet. Millions of vendors are listed on the network consisting of 60+ websites and tens of millions of customers have used the network to plan their parties, weddings and events. PartyPOP.com also provides party and event related tips, themes and ideas, as well as a free full wedding planning software called Seating Arrangement. 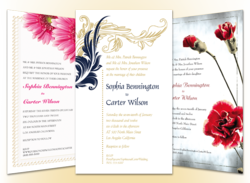 PartyPOP provides every bride and groom across the USA, Canada and the U.K. with free beautifully designed wedding invitations, printed on 80lbs card stock paper with matching envelopes and wedding website. Even door to door shipping is included at no cost. There are no hidden fees, no obligations to buy and no strings attached!